Let me say — in no uncertain terms — that if you think all these markets that are rallying are about to shoot to the moon, I think you need to stand back and be very, very careful. Yes, everything from gold to silver to stocks are rallying — but that does not mean the rallies are the real McCoy — and that they are going to continue to rally. Indeed, ALL of my indicators continue to suggest that big traps are being set, and the next big moves will not be UP, but instead, will be DOWN. Let’s go right to the charts. 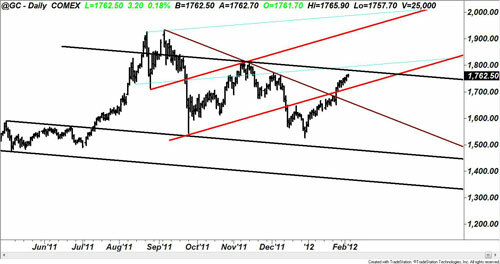 Here’s my latest gold chart. As you can see, gold is now pressing up against the top of a major cyclical trend channel, and it’s going to have a hard time getting through that resistance level. In addition, I’m seeing signs that gold is overbought … and that demand in Asia, outside of China, is starting to slump. So I am still looking for another move down in gold. Long-term investors should hold their long-term gold positions. Speculators should continue to play the short side. 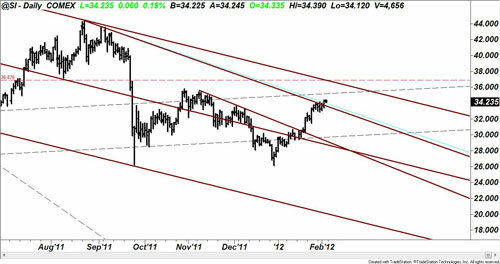 Now, my latest chart of silver. Silver has come a lot further than I expected, no doubt about it. But here too silver is coming very close to a confluence of resistance levels on the chart, and it too is showing signs of being overbought. Plus, it has not hit any major buy signals on my systems. I still expect a major move down in silver, and it will likely come without much notice, so please be very careful in silver. Meanwhile, the dollar’s recent decline is beginning to stabilize. 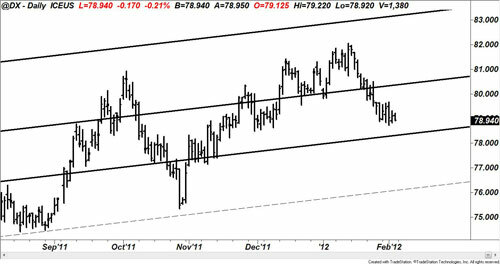 There’s mid-channel support around the 78.50 level on the Dollar Index, and I expect it to hold and give way to another rally in the dollar. This is even more likely given the position of the euro, which has already staged a bounce that is near completion. So as the euro likely turns backs down, we will see another leg higher in the dollar. Now to the Dow Industrials. 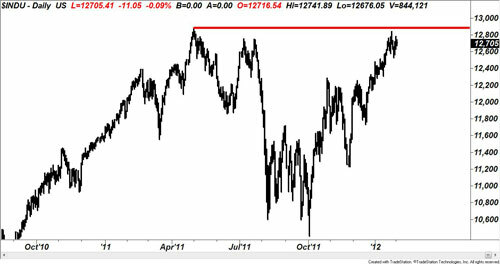 The Dow is up against a triple-top now, and it would simply be foolish to be buying here. We may see the Dow poke a bit higher, but in my experience with triple-tops, any move up from here is likely to be a trap. Interestingly, the Dow is showing signs of what I’ve been warning all along — that it will eventually become a major new bull market. But that time has not yet arrived. We are far more likely to see a hard decline first, then a fourth attempt back to the horizontal resistance line you see on this chart. The fourth time though will be the charm, indicating a new bull market has arrived in the Dow. But I repeat, we are not there yet and a sharp, surprising sell off in the stock markets could come at any moment. That’s it for this week. Stay tuned and best wishes, this is Larry.